Stamp with Me: Snow Swirled : Step 1 and Step 2! Snow Swirled : Step 1 and Step 2! 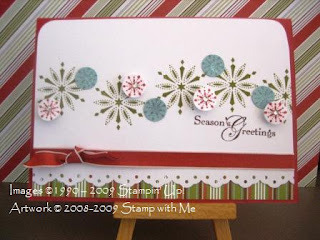 As I promised on Saturday, I have used the "sketch" of the floral vine card to create my Snow Swirled Christmas cards. This time I tried something different, I wanted to test the "stepping up" process, in other words, taking a card and adding that something extra to it. That "something extra" is often as simple as a ribbon, brad, glitter or other embellishment. Sometimes using background stamps or papers might be the "something extra". It's taking your card from a simple design to the next level. Confused?? Here's what I mean! This card is simple. 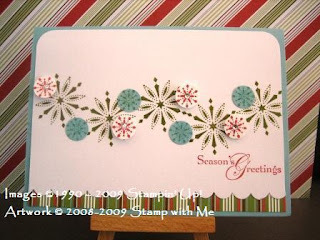 It's a neat design, with a little bit of interest added through the Holiday Treasures Designer Series Paper (DSP), dazzling diamonds and rhinestones for bling on the snowflakes as well as the small snowflakes stamped either on Whisper White CS and then raised with Stampin' Dimensions or on Baja Breeze CS. Now see how you can "step this card up" and make it even better!! Other than the fact I used Ruby Red CS as my card base, the most striking changes are the use of the Eyelet border punch instead of the Scallop Border punch and some red ribbon. Makes quite a difference doesn't it!! Other: Scallop Edge Punch or Eyelet Border Punch, Red Riding Hood Ribbon, rhinestones and Dazzling Diamonds Glitter, Stampin' Dimensionals.